Emile Sinclair struck an unbeaten 53 for Market Deeping at Bracebridge Heath. Bracebridge Heath will win the Lincs Premier Division title if they collect eight points from their final match at Bourne next weekend (September 12). Bracebridge edged nearer to their first title since 2011 after having the better of a draw against Market Deeping yesterday (September 5). The table-toppers struck 241-7 in their 50 overs before restricting Deeping to 170-7. 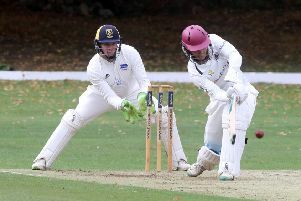 Meli Adatia and Tom Andrews both picked up three wickets for Deeping with Emile Kriek’s unbeaten 53 ensuring they returned home with just a third draw of the season. Bracebridge will meet a Bourne side in pretty good form. They beat Louth by five wickets yesterday with skipper Pete Morgan (96), a centurian the previous weekend, again in excellent touch. Seamer Jack Berry had earlier claimed 5-63 for fourth-placed Bourne as Louth were dismissed for 191. Relegated Spalding were beaten by five wickets bu fellow strugglers Grimsby despite a decent all-round display from Nuwan Jayasena and 54 from Warren Nel. Bracebridge 241-7 (V. Atri 53, M. Adatia 3-67, T. Andrews 3-83). Spalding 181-9 (W. Nel 54, J. Newton 26, N. Jayasena 26, Harrison Tice 5-41). Grimsby 182-5 (J. Wilson 67, B. Volley 58no, N. Jayasena 3-56). Bourne 193-5 (P. Morgan 96).